Nomadic Folk Musician Finds New Fans Michael Hurley's carefully crafted songs and hand-painted album covers have endeared him to a small but devoted group of musicians and critics. Now, more than 40 years into his career, Hurley is reaching a broader audience with a new record on Devendra Banhart's label. 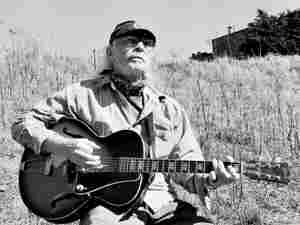 Michael Hurley's carefully crafted songs and hand-painted album covers have endeared him to a small but devoted group of musicians and critics. Now, more than 40 years into his career, Hurley is reaching a broader audience — including a younger generation of fans who are covering his songs — and releasing his new record, Ancestral Swamp, on Devendra Banhart's Gnomonsong label. Hurley drives a car he calls the "Blue Alligator," a 1973 Dodge Coronet station wagon, and he talks like he drives: His thoughts are separated by long pauses. His songs don't seem to be in a hurry, either. Knowing Hurley since the 1970s, music journalist Byron Coley agrees. "To go to a Michael Hurley concert or listen to one of his records really is to enter another kind of universe where time moves a little more slowly, and narratives develop at their own pace," Coley says. "But they develop very fully. "His songs are an unusual combination. The lyrics can be very funny. But few of them tell stories of triumph." Hurley briefly recorded for a major label in the 1970s, but those records quickly fell out of print. He's probably best-known for his contribution to the 1975 recording Have Moicy, a collaboration with the Holy Modal Rounders. Hurley grew up in Bucks County, Penn., with one of the original Holy Modal Rounders. They were all hanging around New York City in the early 1960s, says Rounders member Peter Stampfel, when they started playing a new kind of folk music. "It's a confluence of traditional folk music and, um, drugs, basically, with the latter having a very active influence on the former," Stampfel says. According to Stampfel, Hurley's 1965 song "Intersoular Blues" is one of the first examples of what's now called "freak folk," which he calls an unfortunate phrase. Today, this scene that's been dubbed "freak folk" by the music press is an informal movement of acoustic musicians around the country. Some are inspired by the same recreational influences of the Holy Modal Rounders, as well as an earlier generation of acoustic performers from the 1960s and '70s. Hurley's songs have been covered by a number of younger artists, including Cat Power and the Philadelphia-based band Espers. Espers' bassist, Chris Smith, found inspiration in Hurley's music. "He was almost like my Bob Dylan, like our Bob Dylan of my friends," Smith says. "Where he was so American to a point where it was accurate, but it wasn't based on a decade or an era." Bob Dylan and Hurley were born a few months apart in 1941. They both cut their teeth on traditional American folk music, and they're both painters. Hurley has painted most of his own record covers. They're populated by roughly drawn animals in human hipster clothing — characters from the comic books Hurley had been drawing since the '50s, before he was even writing songs. "A lot of kids were doing that in those days, drawing little stories out and passing them up the aisle," Hurley says. Two of his earliest comic-book characters were Boone and Jocko, a pair of wolves who amuse themselves by drinking wine and flirting with women. Stampfel says they were way ahead of their time. "They're actually the first underground cartoons, I would say. He was drawing them in 1959, 1960, before there were any underground cartoonists. They were basically Bohemian, ne'er-do-well, layabout, slacker wolves," Stampfel says. The line between Hurley's art and his life can get blurry. He refers to himself as Snock and sometimes takes on the persona of his cartoon characters. He's never stayed anywhere long, and he's been equally restless when it comes to holding a day job. "I picked string beans. I planted ginseng. I sold hot tamales on the streets of New Orleans. I sold pretzels on the streets of Boston," Hurley says. Hurley says that he's never held a job for more than six months. "I don't like having to do something when I get up in the morning," he says. "I'd rather just hang out, do what I feel like doing, putter around the house, take a walk, you know." Coley says it's partly this refusal to grow up and get a full-time job that's endeared Hurley to a younger generation of artists and musicians. "The fact that he's been creating the way that he has for so long gives a lot of these younger musicians [the idea] that you can do this: be a nomadic, traveling musician in an Middle Age type of mode, today," Coley says. "And that it actually works." Well, sort of. Michael Hurley isn't getting rich. But he does make a modest living from his paintings and music. He seems grateful that a younger generation is paying attention and helping him get decent gigs. "They have to have their festivals," Hurley says. "Whenever they have one, they have to have their grandfather with them, which is good for me, because my peers aren't going to come out that night anyway." Hurley turns 66 next month, though he still doesn't sound ready to settle down. After six years on the Oregon coast, he may be getting ready to point his old car toward its next destination. "The floorboards start to seem like they're coming up at me," Hurley says. "And I just have to go."